Super quiet operation, whisper-like noise levels. Has air quality indicator light. Ease of Operation & Filter Replacement. Long Filter Life & low replacement costs. Dimensions: 8.5″ D x 12″ H; Weight: 3.74 lbs. 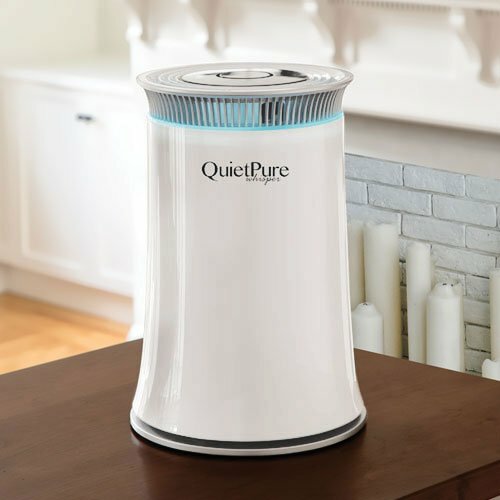 The QuietPure Whisper air purifier efficiently and quietly removes airborne pollutants and cleans air in a room up to 350 square feet. Ideal for bedrooms, offices or smaller living rooms. You will breathe better thanks to the Whisper’s five stages of air filtration which features an Auto Mode that automatically adjusts it’s air flow based on current air quality. The five stages include HEPA filtration for removing airborne particles, activated carbon filtration to remove VOCs, chemicals and odors, Nano filter, Vitamin A for softer skin and reduced stress levels and an ozone-free ionizer to improve your air’s sense of freshness. An air quality display appears as a lit ring around the air purifier to provide you with a clean air measure for the room. Currently this product is not available for California customers. The QuietPure Whisper is an excellent choice for children’s bedrooms, student dormitory rooms, office workers or anyone who wants improved air quality in a smaller room. The QuietPure Whisper air purifier offers air quality monitoring, smart automatic operation and an air quality display for real time feedback. 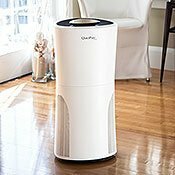 The Whisper air purifier cleans the air in rooms up to 350 square feet; the perfect air quality solution for smaller rooms. A bit noise at highest setting.